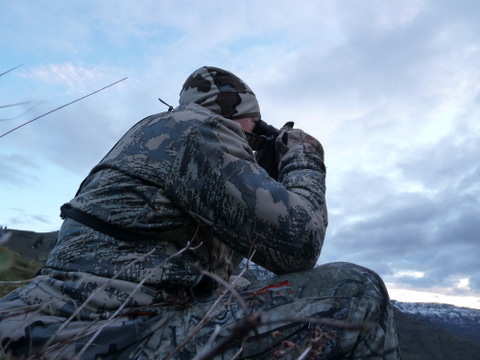 Bear hunting is all about figuring out what bears like to eat, finding their food source, and waiting for the bears to show up. Bears eat whatever is nutritious and abundant at the time, so the food sources keep changing month to month. We glassed and glassed the green hillsides and valleys, looking for bears. By Saturday, we managed to get ourselves situated in a good location. 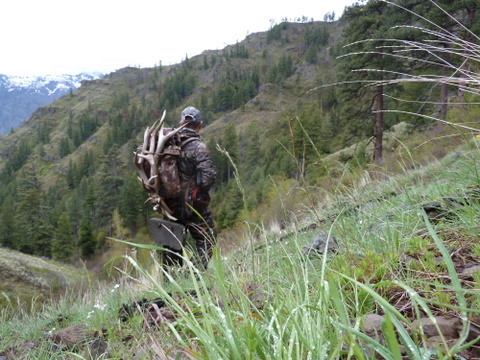 One fun side benefit of spring bear hunting is looking for shed antlers at the same time. Elk and deer drop their antlers between January and April. If you figure out where the animals were at that time, you can really clean up. We hunt places where other hunters rarely go and we actually found antlers from both this year and last year. 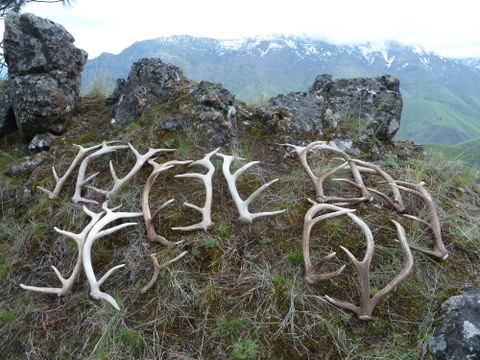 For die-hard elk hunters like us, making an antler haul like this is worth the trip all by itself. By Saturday afternoon, we finally found “bear valley.” I watched a large chocolate colored bear for about an hour while my buddy, Brandon, worked his way up the opposite side of the canyon. As Brandon worked his way along, he spotted another chocolate bear and quickly put it down with his Browning .270. Fifteen minutes later, he spotted the large bear I’d been watching and it was climbing up my side of the canyon, coming right toward me. It was below the rimrocks and I couldn’t see it. I left the goats on the hillside and scrambled down the hillside, but the bear disappeared into the dense brush, never to be seen again. Goats are curious, but my goats had no desire to get anywhere near Brandon’s dead bear. I’d lead them over and then they’d turn tail and run. It was a goat rodeo there for a while, but eventually we managed to get the bear cut-up into packable pieces and get them loaded onto the goats. By the time we got back to camp, we were dead tired. It was a long day of climbing hills and packing out the meat. 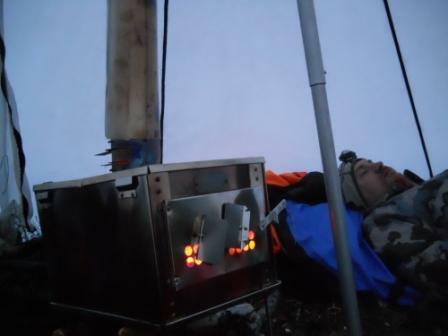 Back in camp, I was almost too tired to eat, but managed to eat a little something before sleeping like a stone. 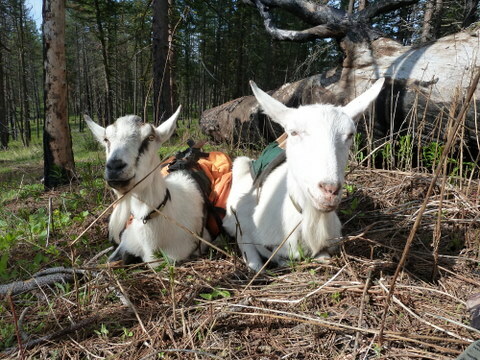 It wouldn’t be a goat packing trip without goat mischief and true to form, we had plenty. At the trail head, while getting the gear out of the truck and getting ready to hike in, it took a total of five minutes before Brandon’s alpha goat, Orca, managed to find the pannier with the food, weasel his snout in there, and pull out the bag of the trail mix. By the time I got to it, he had a hole chewed in the bag and goat slobber all over the remaining mix. And the trip hadn’t even started yet! Brandon bagged his bear on Saturday and on Sunday morning, I decided to go back to the same bear valley. I thought the goats were going to go with me, but they had other ideas. I hiked the heck out of them the day before and they were so tired and sore on Sunday that they could barely get up. I had a full-on goat mutiny on my hands. They refused to stand, then refused to hike. I finally gave up and hunted on my own. It wasn’t worth the fight. I hunted bears for 14 hours that day. I watched a big sow with two little cubs feeding and playing and that was a real treat. 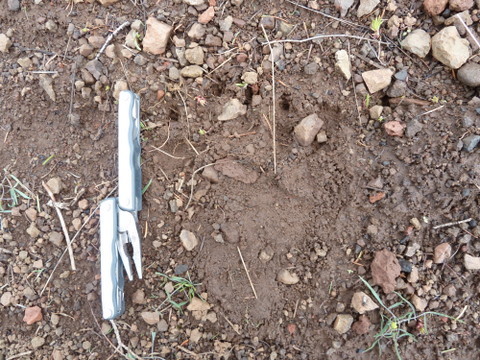 By sundown, I had seen no “shooters”, but did find this massive bear track. The track is seven inches wide. As a general rule, you add one inch to the width of a bear track and that’s roughly how many feet the bear hide will measure “squared” (which is nose to tail plus claw to claw divided by two). This bear would likely square at eight feet. Most Oregon black bears are about six feet. This bear was a real beast, but unfortunately, I never saw him even though the tracks looked like they were made that very morning. The next morning, it was time to make the long hike and drive home. We broke camp and hiked two hours to the base of our mountain pass, then started our ascent. Immediately, my legs were spent. We spent the next two hours slowly dragging ourselves up and over the pass, took a ten minute break, and then headed down the other side. After five and a half hours of hiking, we finally reached the truck, then drove seven hours home. We were happy to have at least one bear in the cooler and happy to be home. A more complete set of photos are posted here. Please note that these do include a photo of the dead bear, so if that’s not something you care to see, maybe skip this part. The trip was grueling, but worth it. I can’t wait to go back. 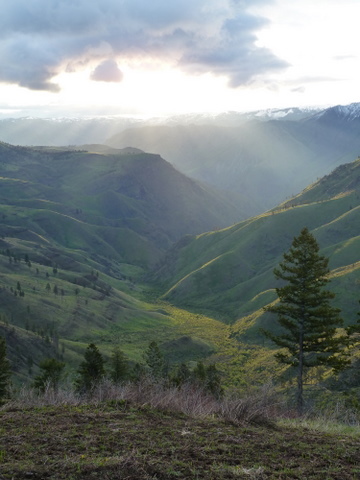 This entry was posted in Bear Hunt, Hells Canyon, Hiking, Hunting, Packgoats and tagged antlers, backcountry, bear hunt, goat, goathunter, hunting, packgoat, shed antlers. Bookmark the permalink. Awesome, goathunter! I am so jealous. Not the whole killing bear part… and the hike back out sounds like it would have killed me at this particular time. But the scenery (and your photos) are gorgeous. Most excellent. What a haul on antlers! Glad you guys had a great time. Thanks for sharing your photos. what a great hunt and a great opportunity to collect antlers in the spring. The Goats look Awsome. Im just two years into my Goat packing experience. Looking forward to getting out to do this kind of remote hunting. Great Pics and video. Good luck on all your adventures.